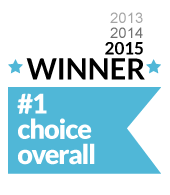 Protect America is one of the most affordable home security companies in the industry. While other companies will charge anywhere from $99 to over $400 in upfront costs, Protect America currently charges $0 in upfront fees. 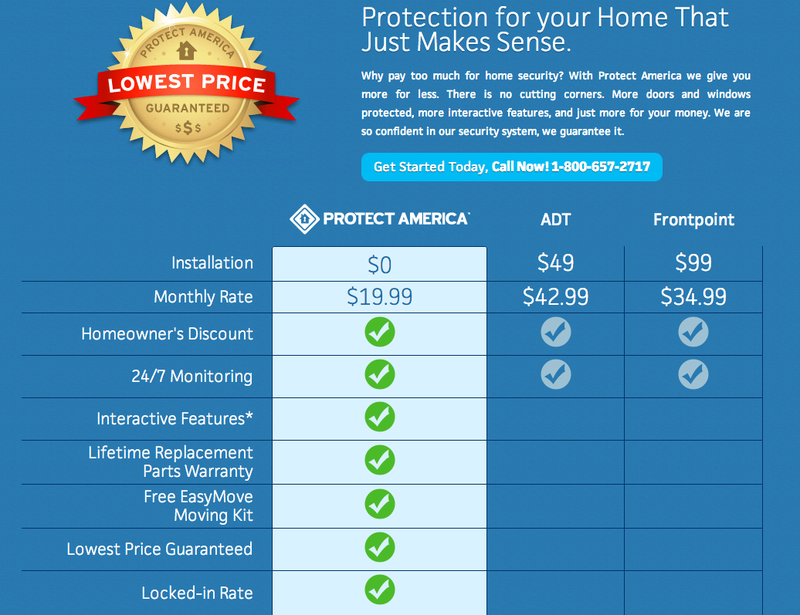 Protect America offers five different home security packages ranging from a locked-in rate at an average of $43.99 per month which is significantly cheaper than competing home security companies. Each package comes with a free lifetime warranty, meaning Protect America will ship replacement parts for all defective equipment at no charge for as long as you are a customer. Once you sign a contract with Protect America, your rate is locked in. They will not raise your monthly monitoring fees as long as you are under contract. Despite Protect America’s affordability, the company sacrifices nothing in terms of quality. Protect America now offers the new Simon XTi, a modern, sleek, and innovative control panel which integrates seamlessly with your smartphone through the Protect America mobile app. In addition to a wide array of home security features (including motion detector, night vision cameras, door window sensors, glass break sensors and more), the company offers a number of home automation solutions to help you control your security system remotely. Protect America’s SMART Connect mobile app controls door locks, lighting, and appliances, arms/disarms your entire security system, and streams or records live footage from up to two of your security cameras simultaneously. Protect America offers flexible monitoring options for nearly every budget. Home security monitoring can be conducted via landline (least expensive), broadband, and cellular communication. 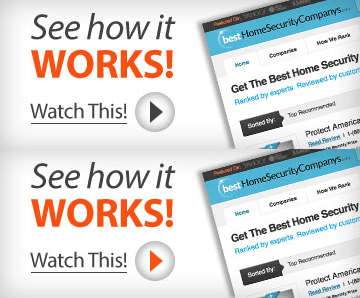 Few home security companies provide all three monitoring services. Protect America comes highly recommended by its customers. Customers who left reviews on our site have been boasting about Protect America’s customer service. They also note that Protect America’s do-it-yourself security systems, which are shipped right to your door, are very easy to install. Protect America has simplified the self-installation process with 24/7 support and a collection of online video tutorials. Their lifetime warranty on equipment helps give peace of mind both when installing the system and using it knowing that if something breaks or no longer functions properly, Protect America will replace it free of charge. Protect America serves customers in all 50 states, which is somewhat rare in the home security industry. Many of its competitors have a much more limited national reach. One thing that we did not like about Protect America is its 36-month contract and its cancellation policy. Other home security companies offer their home security services with much shorter contracts or no contracts at all. And if it so happens that you decide to cancel Protect America’s service, you will be required to pay 100% of the remaining balance of your contract. Other home security companies may only require you to pay a percentage of the remaining balance (some as low as 20%). Paying the full balance can end up costing you hundreds of dollars if you haven’t been on the contract very long..
New customers have 30 days from the date their package was shipped to return their equipment without being bound to the 36-month contract. And while live and recorded video streaming is available on Protect America’s broadband and cellular monitoring services, it is not available with landline monitoring, meaning customers will need to pay extra for this important security feature. Customers don’t like the 36-month contract either and have reported several issues revolving around the contract. Other customers complained that Protect America’s equipment was not functioning properly, specifically window sensors and door sensors triggering false alarms. Based on our research, you likely won’t find a more affordable home security company than Protect America. It is a solid home security company with packages starting at only $19.99 per month with no upfront or installation costs. Protect America’s lifetime equipment warranty is a special feature that few other home security companies can match. It should be noted, however, if you are looking to hire a company to professionally install your home security system then Protect America is not for you. Protect America’s 36-month contract and cancellation policy may deter you from purchasing its service, but given the high volume of positive user reviews praising Protect America’s customer service, it’s easy to understand why most of Protect America’s customers renew their contracts more than once. Protect America is a great choice for those looking to customize their home security system solution. Protect America is a good self-install alarm system option. It comes with both the most equipment and the least amount of upfront costs. See below to read Protect America reviews from consumers. Customer may cancel this Agreement by returning the Equipment within fourteen (14) days of the initial shipment date from PAI to Customer. The return package must be postmarked within 14 days of the original shipment date and returned postage paid to Protect America, Inc., 3800 Quick Hill Road, Building 1-100, Austin, Texas 78728. This Agreement will not be cancelled until the returned equipment is received at Protect America, Inc. Customer shall be required to provide proof of delivery if requested. A $79.00 restocking fee, debited from Customer’s account submitted as part of this Agreement, shall be assessed on all returns. You have 14 days to cancel the agreement. The equipment package must be postmarked within 14 days of the original shipment date. Also, there will be a $79 restocking fee. Assignees / Contractors. PAI shall have the right to assign this Agreement to any other person, firm, corporation or entity without notice to Customer and shall have the further right to subcontract any monitoring service or other services which it may perform. Customer acknowledges this Agreement, and particularly those paragraphs relating to PAI’s maximum liability, third party indemnification and warranty limitations, inure to the benefit of and are applicable to any assignees or subcontractors (including Monitoring Facility and Collection Agency) with the same force and effect as they bind Customer to PAI. Customer may not assign Customer’s rights under this Agreement without PAI’s written consent. Protect America can give a contractual agreement to any other corporation or third party without noticing the customer. If the agreement is given to another entity it still has the same force and effect that it would have with Protect America. Limitation of Liability. CUSTOMER UNDERSTANDS THAT PAI IS NOT AN INSURER OF THE SAFETY OF CUSTOMER OR ANY PROPERTY. CUSTOMER AGREES TO OBTAIN, AT CUSTOMER’S SOLE COST AND EXPENSE, ANY INSURANCE COVERAGE CUSTOMER DESIRES TO HAVE TO INSURE AGAINST PERSONAL INJURY, PROPERTY LOSS OR DAMAGES AT THE PREMISES WHERE THE EQUIPMENT IS LOCATED. PAI SHALL NOT BE LIABLE FOR LOSS OR DAMAGE, RISK, INJURY, DEATH OR EFFECTS OF ANY HAZARD OR EVENT, PROPERTY LOSS OR DAMAGE DUE DIRECTLY OR INDIRECTLY TO ANY FAILURE TO DETECT OR AVERT AN OCCURRENCE OF AN EVENT THAT THE SERVICE IS DESIGNED TO DETECT OR AVERT. Protect America is not an insurer of property or safety of customer and does not provide any guarantee of such. It is the home owner’s job to obtain insurance and maintain coverage against personal injury, property loss, and damages. If Customer defaults with respect to payment of Monthly Monitoring Fees more than two (2) times in any calendar year, or monthly monitoring fee becomes sixty (60) days past due, then Customer agrees that PAI may terminate service and the remaining applicable balance of the Agreement will be immediately due and payable. PAI may draft Customer’s account for the entire remaining balance, disconnect monitoring with prior notice or require Customer to pay yearly in advance for services. In addition, Customer agrees PAI will have no liability if disconnection occurs due to a past due balance or otherwise. If a customer misses at least two monthly payments and becomes sixty days past due, then Protect America can cancel the agreement and requires customers to pay the remaining monitoring balance. PAI may suspend or cancel this Agreement, without notice and without liability or penalty in the event the Monitoring Facility, the communications facilities connecting Customer’s location to the Monitoring Facility, or other equipment are destroyed by fire, catastrophe or by any other means, or are so substantially damaged that it is impractical to continue service; or in the event that PAI is unable to either secure or retain the connections or privileges necessary for the transmission of signals between Customer’s location and the Monitoring Facility and the law enforcement agency or other emergency contacts for any reason or cause whatsoever. PAI assumes no liability for the interruption of the service due to any cause and PAI will not be required to supply the Service to Customer while interruption of the Service for any cause continues and Customer is not entitled to any refund or credit of any charges for such interruption of service. If for some reason the connection to the home security system becomes lost or unable to maintain, Protect American can cancel the agreement without liability or penalty. They are not responsible for any lost connect or interruption of service due to events out of their hands. 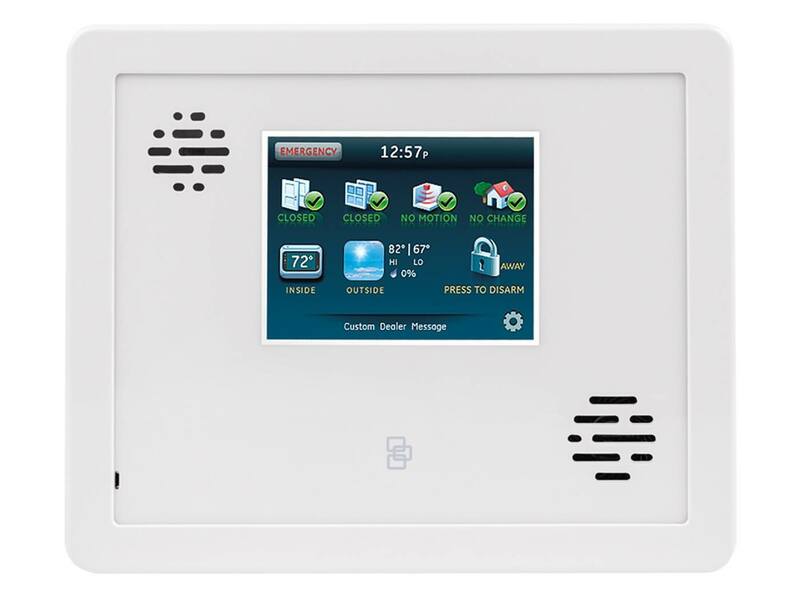 Protect America (PA) offers a basic home automation package that is ran through the home security control panel. The home automation equipment adds wireless control to everyday household tasks such as turning lights off and on and controlling various appliances, it can even lock and unlock the front door. All of this equipment is able to function together through Z-Wave technology, which is the most widely recognized standard for home automation. Also, the system is a self-install product, meaning the home owner can install the new equipment at their convenience. If you choose to go with the basic home automation package for zero money down this package does not include as much equipment as most home automation packages provided by other companies. For example, in their “free” offer they only include 1 appliance module, 1 indoor siren, 1 freeze sensor, and 1 flood sensor. For anything else you must pay extra. Most home automation packages include at least one video camera and a video monitoring system, however, PA customers must pay an extra $199 for the camera and an extra $10 a month for monitoring. Protect America provides a basic home automation package for nothing down, which is a nice extra feature if you already own a home security system through them. However, if you want extra features such as door control and video monitoring it costs extra and can add up quickly. We suggest you discuss package options with a Protect America representative to determine if their home automation system is right for you. Protect America began offering the Simon XTi which is a better, more modern control panel than the Simon XT which you can see below. You’ll only be able to take advantage of the Simon XTi with a Silver package and above as well as broadband and cellular monitoring. The Simon XT should be placed where it is easily accessible. The Simon XT allows users to call for help (emergency responders), arm/disarm your system, and control the functionality. 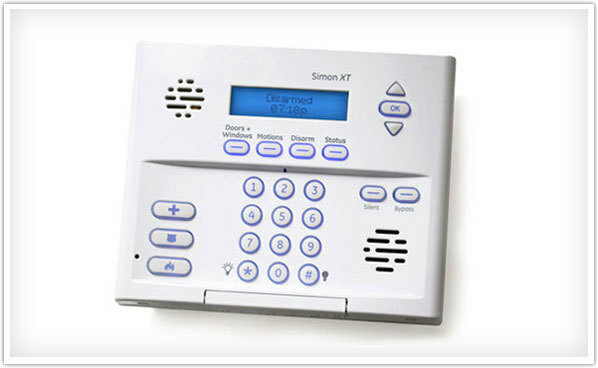 The Simon XT has the ability to control up to 40 security equipment controls (including sensors and home automation functions). The Simon XT is basically the brain of the Protect America security system, and it allows you to control all features and equipment. The Simon XT Touchscreen allows you to voice commands and offers a a substitute for when you cannot check the main control panel. Users will want to place Protect America’s video surveillance cameras in high traffic areas, like by door entries/exists and hallways. 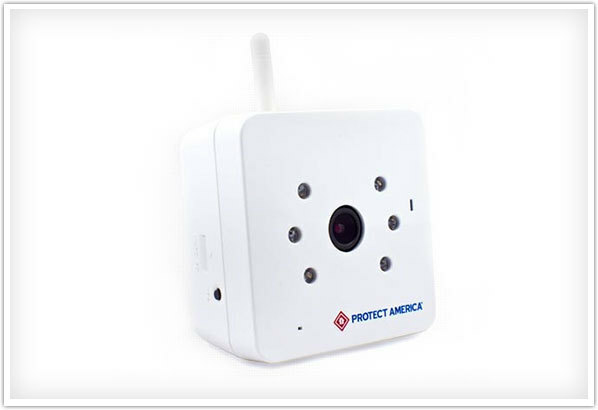 Protect America enables users to view the video surveillance through their “Smart Connect App.” Live footage from the camera can be viewed at anytime from anywhere as long as they have WiFi connection. The video is high quality and can be easily accessed. The Mini Pin Pad is not necessary, but it does add a level of security in the event of an emergency. These pin pads allow you to call for help and alert the authorities/responders. These pin pads also allow home owners to alarm and disarm the security system by typing in a personalized code. The pin pad allows for additional convenience and ensure the security system is armed when it needs to be. The talking wireless keypad has the same functions as the mini pin pad, meaning it can arm, disarm, and send emergency signals to the authorities. It allows you to communicate and can mounted on your wall. Protect America offers several different types of sensors. 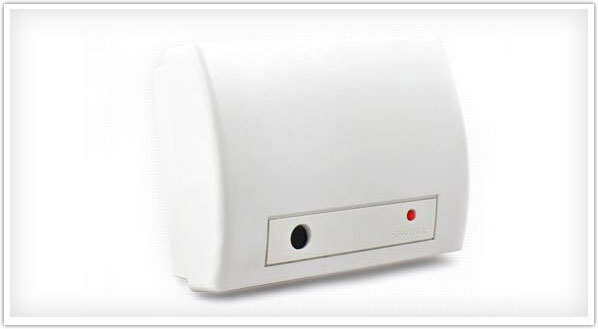 They have the door and window sensors which detect whenever the door or window is opened. The Protect America door and window sensors are wireless micro sensors which means they do not have to be plugged into your wall and are hidden out of the way. It is advised that customers place a sensor on every door and window for optimum security. Protect America also has a garage door sensor. There can be several thousands of dollars stored in garages, which means it is critically important to protect it. Keep your cars, bikes, tools, and other items stored in your garage safe by installing a garage door sensor. These sensors are mounted on the inside of your garage door. There is also the option to install motion detectors. 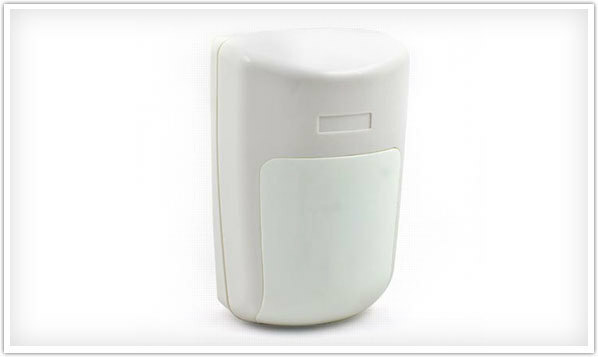 These motion detectors are easy to install, and they detect both heath and movement within a 25 foot range in a 90 degree arc. They can be installed in the corners of rooms, and it is recommended to put these in high traffic areas in your home. Lastly there is the Glass Break Sensor that is to be mounted in an open space near windows or glass doors that you would like to secure. Protect America offers some of the latest and most advanced technology on the market. Since Protect America allows their customers to customize their home security system to fit their home, it provides a high level of security that ensures your home and family’s safety. For a low monthly monitoring fee, Protect America’s security system will secure your home’s vulnerabilities. My daughter and her children moved into a rental home. I had concerns for their safety because they were by themselves, so I did my research and felt that the best service would be Protect America. My daughter eventually purchased a home. When it came time to cancel our service we were told we had to give a 30 day notice even though we didn’t live in the house for that 30 days, it wasn’t our contract. So that was acceptable however the notice was given in July 2018 here it is April 4th 2019 and they are still taking $60 a month out of my daughter’s account and hassling her about canceling our service. They said she gave him the wrong email they said she didn’t call soon enough it’s been one excuse after another. My daughter is extremely ill she’s going blind she needs this money for medical bills. I called and try to explain they were very empathetic very good customer service but told me that there was really nothing they could do and they finally agreed to give us a $200 refund on what they had taken out. To help us out they agreed not to hold next month’s payment out and if she signed the new email they sent out right away they would go ahead and cancel it but as of now it’s still current and in effect. I could not recommend this company to anybody. You should care about your customers and if you read the reviews for Protect America you can see when it comes to the cancellation service it’s very difficult to get them to stop their service and they try to continue as long as possible to receive payments. Everything has gone well. Even though we had a problem with some equipment failure it.was taken care.of quickly. This company’s a scam and way overpriced. They tell you $19.99, but then the bill appears as $58/month and there’s nothing you can do about it because they lock you into a 3 year contract. When you call to speak to customer service, they tell you either pay the remainder of the 3 years upfront or find someone to take over your contract. I signed up to Protect America in Feb 2016. Everything was good and the customer service reps treated me kindly and decently, at the time. After a year went by, we felt like we didn’t need the service anymore. I called in to see about possibly ending my contract early. The customer rep said that it’s possible but I would have to pay 41.99 times the remaining months left. Which we couldn’t do, so I decided that we will continue making the payments. Before the phone call was over the customer service rep said that what she could do is set my account to not go to a month to month contract. I accepted that and that ended the phone call. The following year we asked about leaving again, this time just ready to pay the remaining fee, but was persuaded not to do it. This customer rep also told me my account is noted not to go into a month to month after January 31, 2019. On January 4th I wrote into the chat, which forced me to send a email to the company. I asked if this (Jan 1st payment) was the last payment of our contract. Never received a phone call or response. On Feb 1st, my account got charged which led me to call into the company. The first customer rep, had no recollection of my initial first phone call two years ago. We went back and fourth about this for sometime until I asked to speak to a manager. She said that a manager would call back. Instead of a manager calling me back, the same woman, but posing as a new person, called me back. This time she was snippy and rude because I wasn’t accepting the fact that they never had a phone call from me two years prior. I eventually was able to get a manager, Jesse S, who was also doing the same run around. In the end, he told me the best he could do was send me a cancellation form so February would me my last month and that I won’t be charged on March 1st. I opened a dispute with my credit card company and now I’m waiting for the verdict on that. Now today (March 1st) I’ve been charged again. I went to an email response that Protect America and they said that I requested for my service to be cancelled on March 31st 2019. Instead of Jesse S sending me a contract with the correct cancellation on Feb 28th, it was March 31st 2019. I can’t believe I didn’t read the entire document, before signing it, a lack on my part. However, the company knew exactly what they were doing. I can’t recommend this company to anyone. When I called, the person was extremely nice and helpful and they told me the price monthly and the contract and that they would help me install it over the phone. It was very nice. He was very patient with me with me being elderly. The customer service answered all my questions when I’ve called and they’ve been very courteous and patient with me. Everyone we talked to was top notch and professional. There was excellent customer service people. They are very knowledgeable and professional. Overall, it’s been a very good experience so far. Every time, they help me out to do something. They’re always more than willing to help and they’ve always been able to help. Put simply, their “service” is a sham. We signed up for a contract shortly after purchasing our house. Everything was fine, until we realized we were paying $54 a month for NOTHING. Our alarm went off while we were out of town and they tried to call us. We were in an area with no cell service and did not get a notification for a missed call. When they didn’t get a hold of us, they did NOTHING. They didn’t keep trying to get in contact with us, they didn’t call the police, they did nothing. After we realized their “service” was useless, we tried to cancel, which of course even though their company is a sham they wanted us to pay the whole balance of the contract. We refused to do so, they gave us a discount for three or four months, and then we paid the monthly fee for the rest of the contract. And then when we went to cancel apparently we didn’t cancel early enough, so they forced us to pay an additional monthly fee. TLDR: this company is a sham, they won’t protect your house, don’t give them your money! good price, good service. too early to say how long that will last. Horrible Company. Do not sign up. After reading reviews that they keep charging you after cancellation, I wrote them 3 months in advance of our end of contract date, notifying them that we did not wish any further services from them of any kind. Sure enough, they kept on charging my credit card month after month. Had to get my credit card company to block them. What a hassle. I have had two other homes in my 20 years of homeownership, all with security systems. PROTECT AMERICA is the WORST!!! Please , avoid this company at all cost!!! Nothing even began right, from the beginning , the system arrived two days later than expected, the equipment was bulky and not all self- installer friendly. Read the reviews. This is the worst EVER.Sharon Richardson ( SC). I have had this service for 3 years. It was good until its time to cancel. They hold you hostage and run up a tab. The equipment will cause your alarm to malfunction and false alarms will rack up a big tab. They harass you to no end. If my contract is up. Cancel the service. No, they harass you and make it difficult to cancel the service. Don’t go this route. Make sure you renew your alarm permit, if not you will get a bill from the police. Because there equipment is only good for the contract term. The adhesive falls off and triggers the alarm. Customer service was very knowledgeable and professional. I donÕt see how they can improve, I am completely satisfied. I didn’t like how I had to install the service myself. I would have rather had a professional do it. The customer service rep was polite, patient, and professional. The product is very easy to use, and it has taken all of my worries away. Customer service stayed on the phone with me for two hours. The camera given is very sensitive and it works well. I like how I can use the app when the alarm goes off. Protect America is easy to work with, and the service works perfectly. I’ve only had the system for a week now and the good is this: no nomey upfront to get the system.. I get over 15 sensors including motion for the same price as adt. As a recent victim of burglary it’s important I get the value for my money and I wanted every window and door protected. ADT could not match this so AP was the best deal. A 3 yr contract is nothing compared to the peace of mind you receive. Plus ADT does exactly the same I know I’m a former ADT customer!! We'll get you set up with your free quote! By submitting this form, I consent to receive calls using automated technology from Protect America at the number provided and understand this is not a condition of purchase.